Hi again! This is just a little update, I’m still working on level generation. Generate an abstract area tree, based on parameters we define in the editor per level. This includes main- and sidebranch depth as well as an extendable set of room layout types (different generation algorithms) and their appearance probabilty. This is completed. 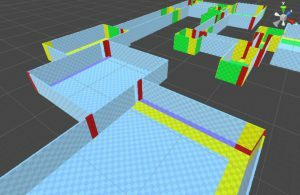 Generate the floor plan: Generate rooms based on the input algorithms and connect the generated rooms along the given tree. Tests showed that a breadth-first algorithm is much more reliable for generating a floor plan than a depth-first algorithm – depth first does often fail because it tends to trap itself much like in a game of snake. This is done but can still be extended by writing more generation algorithms (i.e. cellular…). Place geometry based on the floor plan. Each room knows its tiles and is provided with a design pattern (sets of meshes as well as placement algorithm settings). This is what I was working on recently. Most important is that I need to take care of tile reduction, as there can be millions of tiles and I don’t want them be all unique game objects. In the gif, different mesh sizes are identified by different colors from red – small to blue – large. Also, the environment will be more believable if things don’t all look grid split evenly. Create gameplay, means placing gameplay relevant elements. This is what I will do as soon as I finished step 3. This will also be refined/extended until all development is finished. To me these last two weeks were the hardest in all the development process and I’m glad its finally working.